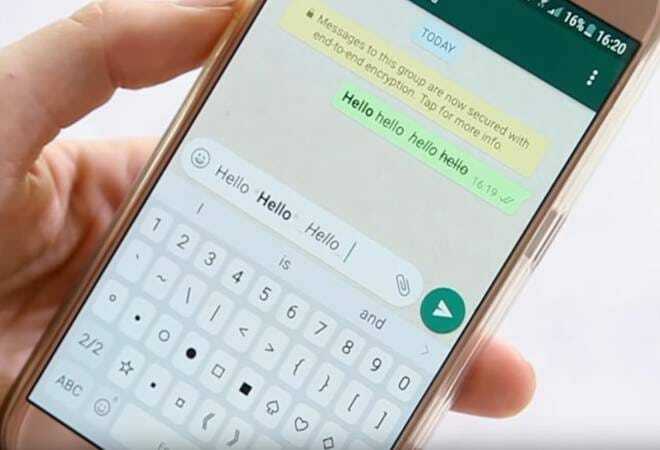 WhatsApp messenger is all set to introduce a host of new features like fingerprint lock, consecutive voice messages and 3D touch action for Status in 2019. Ahead of general elections, WhatsApp has already announced the new group privacy feature to control the misleading information from going viral. WhatsApp has over 22 crore users in India and it is currently the biggest market globally for the chat app. It is, therefore, no wonder that WhatsApp is trying hard to bring new features every few months. Dark Mode: Dark Mode for WhatsApp has been a long awaited feature of the Facebook owned messaging app. The rumours for this feature have been doing rounds for long. The feature that has been under development could soon be unveiled 2019. There are several advantage of having a 'dark mode' other than it being easier on the eyes and offering striking new look. It also saves battery of your device, especially the ones having OLED displays. 3D Touch to check WhatsApp status: This would be an iPhone exclusive feature that will allow Apple iPhone users to check their WhatsApp status with the device's 3D touch without sending a read receipt message to the person whose story you were secretly looking at. WhatsApp fingerprint authentication: The WhatsApp fingerprint authentication feature will add an extra layer of security as WhatsApp users will have to authenticate themselves every time they open the app in future. The new authorisation method will make the third party locking apps, which were very popular, redundant. Consecutive voice messages: The consecutive voice message feature is available as a part of WhatsApp Beta for Android 2.19.86. The feature will allow the user to automatically play voice messages if they are sent in a sequence. After the end of the first voice message, WhatsApp will notify the user with a sound. Immediately after the sound it will play the next voice message. In between, the user doesn't have to take any action. Ranking of contacts: WhatsApp could soon roll-out contacts ranking system for the Android. The feature will automatically ranks contacts by detecting "which contacts you interact with more". Grey area that makes BJP's NaMo TV an 'advertising platform', not a TV channel!